Eating Your Greens—Microgreens, That is! Small edible plants called microgreens aren’t just tasty toppings for soups, salads, and sandwiches. They’re also healthful. According to results of an Agricultural Research Service (ARS)-led study, eating red cabbage microgreens helped mice moderate their weight and cholesterol levels despite a high-fat diet. Over the past several years, chefs have touted the taste, texture, color and delicate appearance of microgreens, which include certain herb, grain, and other vegetable crops. Interestingly, some microgreens pack more nutrients in their tiny leaves and stems than full-grown plants. Red cabbage microgreens, especially, have garnered attention for their potential to help protect against chronic illnesses like cardiovascular disease. 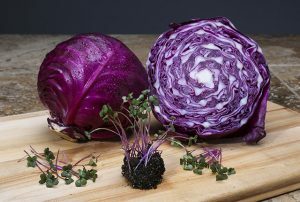 However, research has never investigated whether eating red cabbage microgreens reduces the risk of cardiovascular disease more than eating mature cabbage plants, notes ARS chemist Tom Wang. To learn more, Wang, together with his ARS and University of Maryland colleagues, fed 60 young mice one of six diets: low-fat, high-fat, and with or without mature red cabbage or red cabbage microgreens. Both types of cabbage were freeze-dried and served to the mice in amounts equivalent to one cup of vegetables per person per day. Mice on high-fat diets containing either red cabbage type had lower blood-cholesterol levels and less liver inflammation than mice on high-fat diets without the vegetable. Mice on diets with red cabbage microgreens had lower levels of “bad” cholesterol than mice on diets with mature red cabbage. Additional research is needed to determine whether the high amount of phytonutrients in the micro greens led to the health benefits observed in the mice, according to Wang.